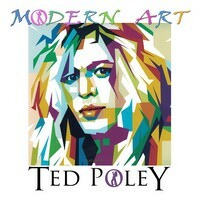 For all those that are introduced to Glam Metal/Hair Metal and all the genres of this particular form of Metal, the name of Ted Poley is not unknown: he is the vocalist who recorded with many names as DANGER DANGER, MELODICA, BONEMACHINE and TOKYO MOTOR FIST, but he has a solo career as well. And on hands, we have his latest release, called “Gypsy at Heart”. This time, he has the members of DEGREED playing with him. Of course, his voice has the same touching silk aggressiveness of always but preferring the use of more low tunes. And on “Gypsy at Heart”, he is exploring something musically accessible for a broader public, a musical approach that leads to AOR/Melodic Rock, but with a modern and even Popish outfit in many moments. It doesn’t mean that it’s bad, but for all those who are looking for womanizing and impacting songs as “Monkey Business” and “Crazy Nites”, I must warn you that it’s not like those on this album. As you could think, the sound quality of “Gypsy at Heart” is really amazing, with very good balance between the aggressiveness of Rock and the clean and tender atmosphere that such musical genre needs. And the instrumental tunes are in the right way, clean and with the right effects (especially the guitars that presents a fine distorted tune). All songs are excellent, but the melodies of “New World”, the hooking chorus and energy of “Gypsy at Heart”, the Melodic Pop scent that fills “Bury Me” and “Out of Control”, the sweet power ballad “Time”, and the melodic groove that can be heard on “I Know a Liar” are the ones that will nail in the place where you are, and take you by the ears. Ted is really an amazing artist, so listen to “Gypsy at Heart” out loud!